The Tao of Gini: It is.......isn't it???? 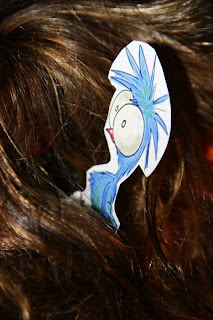 "It is CRAZY HAIR DAY at school today, right Mom?" That's what she asked on her way OUT the door this morning. Geez - I sure hope so, cuz that is some CRAZY hair! That looks like it took a hell of a long time to fashion. 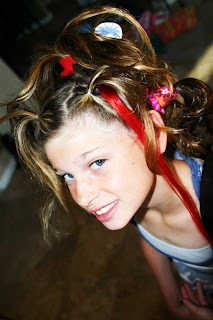 She can totally pull off crazy hair and make it CUTE! I want to go to Hannah's school. How fun is THAT! 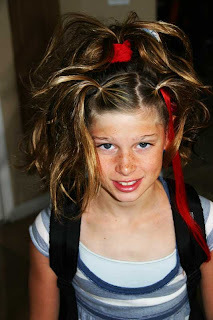 they have "crazy hair day" at school? oh my goodness... things to look forward to!